After our new dear friends George and Merima had a tearful farewell with this magnificent boat, we drove them to the airport and had our own set of good-byes. 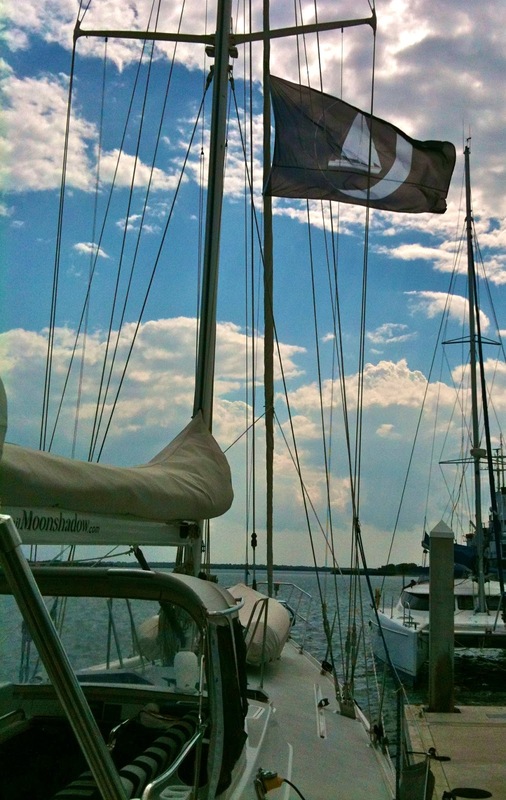 Then we returned to Moonshadow, raised her new "battle flag" (thanks again Ryan and Scott!! ), and enjoyed a delicious bottle of Chandon left behind by George and Merima. The events of the last few days have caused Deb and I to realize the unspoken responsibility that falls on us to take care of this boat that was George's home for 18 years, and Merima's for five years. Moonshadow is the centerpiece of some of the most significant experiences and memories of their lives so far. It just won't do to let Moonshadow sit idle, or fall into disrepair. It's also finally sinking in that all of our work has actually come to this: The boat of our dreams is ours and she'll take us wherever we want her to. WOW!! There still a few days chores getting all of our things stowed away, familiarizing ourselves with Moonshadow, and tending to a few items discovered during the survey, but hey what's a few days now? Soon we'll cast off and let Moonshadow take us south for some clear water anchorages, swimming, snorkeling, and long slow days in the sun.